I thought I would love this book, but sadly it was not what I had expected. I haven’t read Virgina Boecker’s The Witch Hunter series, but I really wanted to give this a shot because I couldn’t resist a spy novel. 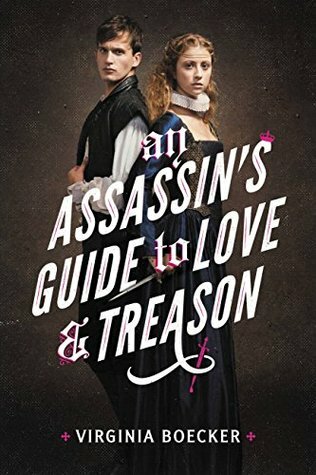 I was hoping for a suspenseful YA historical spy novel with a dash of romance but what I got is a dramatic YA romance between two Star crossed lovers. Honestly, It has a good concept but I think this one is not for me because I’m not fan of Shakespeare and this book has a lot of Shakespeare references. People who like Shakespeare will definitely enjoy this book more than I did. The historical setting in this book was perfect. I really loved it. The characters were good but not great. I really liked the bi representation in the book. Seventeen Year old Katherine Arundell’s father gets killed by the Queen’s guards for being an illegally practicing Catholic. Luckily, Katherine escapes from the guards and runs away with a young priest in training. Later, she discovers that her father is one of the nobles who’s involved in the murder plot against the Queen Elizabeth I which is a highest treason in their country. To fulfill her father’s role, Katherine disguises herself as a boy named Kit and joins with the other rebels. Nineteen year old Toby Ellis is a poet and a writer but he also works as a spy for the Queen. To lure out the rebels who’re planning to assassinate the Queen, Toby comes up with a plan which involves William Shakespeare’s newest play, which is to be performed in front of Her Majesty. To kill the Queen, Kit aka Katherine joins the Globe’s theater group and she was cast opposite Toby. Something In Kit intrigues Toby even though he’s one of the suspect. They gets drawn to each other and develops forbidden feelings for each other, but when dangerous secrets and betrayals are finally unveiled, everything comes falling down for both of them. Katherine is a strong character but I don’t think she would make a great spy. When she gets caught, she gives away her real name easily that was kinda stupid. She’s only a normal girl who wants revenge for her father’s death. So don’t expect her to be a kickass spy. On the other hand, we have Toby Ellis who’s actually a bi. He harbors many secrets and serves the Queen in order to survive. I honestly enjoyed his character more than Katherine’s. As for the romance part, I really liked Kit and Toby’s relationship more than Kat and Toby’s. Kit and Kat are the same person but I loved the queer relationship more. *wink wink*. Shakespeare was hilarious and insane. Although I didn’t get some of his references, I really liked his character. The plot was interesting but it was lacking the seriousness and tension which is one of the major issues I had with this book. The romance was okay. I should’ve known this wouldn’t be a slow burn romance because it’s Shakespeare. This book has a slow start and the pacing improves only in the second half. There’s not much action in this book which is a little disappointing because I was hoping for a lot of kickass spy action and assassination attempts. I don’t know about Lady Jane, but this book was nothing like Gentlemen’s Guide to Vice and Virtue. The writing was pretty good. I don’t have any issues with it. The book was written in first person dual pov’s. The world building was fantastic. I really enjoyed the historical setting the author has created. It felt very authentic, it looks like she has done a great amount of research for this book. Overall, it was an okay-ish read for me! It was a decent YA historical novel filled with drama, conspiracies, and forbidden romance. I liked the ending part which is why I gave it a three and a half star instead of three stars. Just because I didn’t love it, it doesn’t mean it was a bad read. If you’re into books inspired by Shakespeare then I highly recommend this book. I’m pretty certain that there are many people who’ll love it. Aw, that’s a shame! I was hoping for the same thing you were: suspenseful YA historical fiction novel and I’m not much of a Shakespeare fan either. No reason to bump it up my TBR list now. Lol Great review, Raven! Thank you, Mina! If you’re looking for a decent YA historical romance then I would recommend this book but If you’re looking for something action packed then steer away from it. This whole book was a star crossed lovers cliche! Wonderful review as Always Raven! Pity the characters were only good, not great. Good about the bi rep though. Shame this was just an okay-ish read. Great review! Thank you, Marie!🙂 I was really hoping for a badass heroine and an angsty slow burn romance so I was kinda disappointed. Our October wrap-up, from The Life of a Booknerd Addict! Thank you, Helena! Yeah, there’s some spying in this book but there’s not much action. If want an action packed read then I wouldn’t recommend this book. That’s too bad it did not meet your expectations Raven! Sorry this one wasn’t as good as you hoped. The blurb definitely made it sound interesting. Better luck next time! I have a love/hate relationship with Shakespeare. I struggle with books that I was forced to read in school, I didn’t enjoy any of them. Including every single one of Shakespeare’s books we had to read. But when it comes to movies….like Romeo + Juliet from the 90s with Claire Danes and Leo, oh I loved it. So I’m not sure where I’d fall with this book but I’m sorry it wasn’t beyond amazing. Fabulous review! Ahaha! I’m not big fan of Shakespeare either! I loved Romeo and Juliet movie! It’s my favorite movie especially because it has LEO! 😍 Anyways, I think you’ll like this one, Jen! It’s a star crossed lovers story! If you want to read it, give it a shot! Eeks, I love that you love that movie too! I use to be obsessed with Leo and watched every single movie he was in and now I’m on a Josh Duhamel kick ha! I adore all things star crossed so sounds good! It’s not a great read if you’re looking for something action packed. If you’re not fan of Shakespeare and the theatre thing then avoid this book!